Greetings! I have just returned from visiting family, "back east". While I was out there I was able to use the internet services that were available in the public library. Although there was never enough time to read all my mail, I did look at my LJ. I noticed that all of my manips and screencaps seemed wan and pale on all of the library's machines. Boo hoo hoo! The monitor I use at home is rather old. Too old, it seems. I have the "bright" turned all the way up, but everything looks loads darker on my machine. I was shocked to see how different my work looked on newer, very much brighter monitors. Therefore, I re-did every one of my Frodo Art Travesties, darkening them considerably, re-naming them, and reloading them into the Photobucket album. Now, then. As an "I'm back" gesture, I have made a new manip. But one day, when he went into the house to do his work and none of the men of the house was there in the house, she caught him by his garment, saying, "Lie with me." But he left his garment in her hand, and fled and got out of the house." P.S. The other thing I did visiting my mother in D.C. was to go see Brokeback Mountain. Three times. I'm taking our daughter on Friday. Perhaps I will write a post on it. Suffice it to say, not since RotK have I been so impressed and moved by a film. Here's a link to the Frodo Art Travesties album, if you would like it. Very nice manip. Welcome home! Hi, back to you! And thank you, Aquila, for the welcome. Tell me, is this about right on your monitor? It should be dark and richly-hued, like all of Reni's stuff, but not too dark, so that the finer things cannot be seen. I would appreciate a "reality check." I wish the original print had better resolution. I could have done a close-up of that section and made it much bigger. But the image just dissolves when I try to blow it up significantly, unfortunately. When I look at Potiphar's wife, it interests me that her colours and her lighting are so "acid-y" compared to his. I suppose that was done purposely. At first I thought her look was merely beligerent, but around the eyes and the upper lip, I think she actually looks a little needy and tremulous, betraying her extremity, that she would do such a thing because she could not keep him with her. Having just seen "Brokeback Mountain" multiple times, perhaps she is having an "Alma moment," with Joseph heading out the door, no matter how she protests, to go on that fishing trip with -- whom? I'll bet Joseph doesn't catch anything, either. Fantastically made, Mechtild, very convincing. And the colors are fine. Thanks, Belegcuthalion. I did lighten it just a tad. Guess what? Last night my husband brought back a new, giant monitor from where he works that they were going to get rid of because they are going all flat-screen. This monitor has a great space to work and make the image really large for doing detail work or having two windows up at once. Also, it is more like the level of brightness that I have seen on so many other machines. Whoopee! I don't thing your past travesties have been too light. I'm having a little bit of trouble making out the drapery behind that scandalous woman's head. Is it meant to be black? But then, if it weren't dark in here 'cept for my monitor, I could just reach up and tweak the contrast on my screen. Anyhow, the past travesties have been just fine, and I don't hink you're gonna satisfy the needs of all the monitors in fandom, so don't tear your hair! I guess I didn't get Brokeback Mountain. But I've already waxed all opinionated about in my journal, so I won't repeat my trepidations here. Aquila (Hi, Aquila!) says that in 1963 they couldn't have shacked up together, but it was really only Ennis' childhood trauma that kept him from agreeing to it.... Shoot! I had a point, but it's fled my insomniac, middle aged brain! Bother! Oh! found it again...But history shows that plenty of "bachelors" did ranch together. They may have done so as chaste as lambs, or they may have been lovers, but I think people mostly lived and let live for many many years. So, except for that trauma I mentioned earlier, the premise of these two lovers being kept apart kind of un-spooled for me. It just seemed like a story about two people finding a multitude of ways to be miserable. Thanks for commenting on the darks and lights, Honey. Yes, a person's monitor can be adjusted to bring up the darks and lights manually. The problem with our old monitor is that I already had it turned up as bright as it would go and it still made the images really, really dark. When looking at art gallery sites I would be thinking, "Why did they make these prints so danged dark?" Now I know it's not them but me with the problem. I just wrote to Belegcuthalion above that my husband installed a newer [used] monitor last night and it is a BIG improvement, literally. 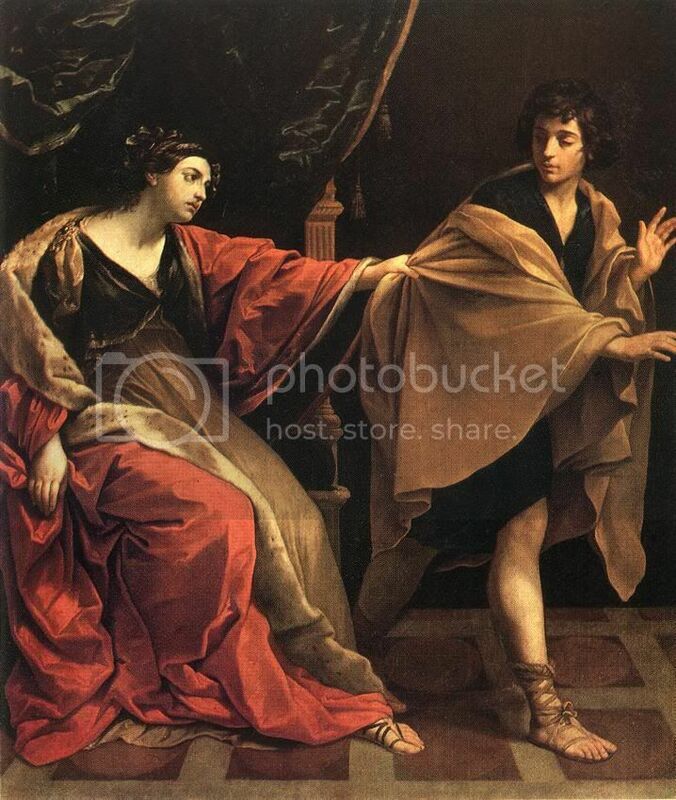 The original of Joseph and Potiphar's wife is very dark, like a Caravaggio (or like a Reni, for that matter, if you will recall the extreme contrast in his St. Sebastian). Ah, Frodosweetstuff! So glad you liked the Reni of St. Sebastian. You know, if you go to the top of this post and click the tag called, "Frodo art travesties," you will get the page for that manip which tells all about it. The painter Guido Reni seems to have had a rather wretched personal life, but he sure knew how to provide me with great paintings for manips! I share the Brokeback love. An amazing film - deeply felt and acted. And your manip makes me want to act out lots of Frodo hurt/comfort. The l'il purdy will always be my first love. Pearl, how nice to see your words in a comment box here, and I'm so pleased you like the manip. Everytime I say, "This will be the LAST one!" Perhaps this time it really will be true. I am glad you got to see BBM. I heard about it through Maeglian's LJ, who allowed me to talk about it at length with her, in terms of her anticipation, since I had not heard of it and hadn't read or heard of the story. Since seeing it, I have talked with her as much as I may without spoiler-izing her. I can't wait till she sees it! I want to discuss changes from book to film and how they changed the story, that sort of thing. Yes, I really, really loved and was moved by the film, in terms of its content and its sheer quality. While I was gone away and checking a few times into my mail via the public library, I think I remember seeing you post positive words somewhere about King Kong. Especially since so many LotR/Frodo fans seemed not to like it, I just wanted to say I thought it was really a wonderful film in many ways, well worth seeing and thinking about. Yes, too many dinosaur chases (except for my daughter who wanted more), but there was so much that was excellent in terms of good old fashioned moviemaking. I'm off, now. Guess where? To Brokeback Mountain. I promised my daughter I would take her to see it when I got back home if it was playing in our city. I opened last Friday. It's only playing on one screen in one of the three multiplexes in town, but that's better than nothing. I'll be curious to see who else goes. I love the face/expression in this one! I do enjoy art that has some action in it. Heh. Too bad Joseph's leg doesn't look like Frolijah's. Can you manip in a whole leg? You'd have to get a pose of Frodo with his breeches off. *rrrrrriiiiiiiiiiipppppppp* There you go! Get busy! Yes, Joseph's leg is decidedly sturdy-looking. Hey, that cropped version would made a great Ripper icon!